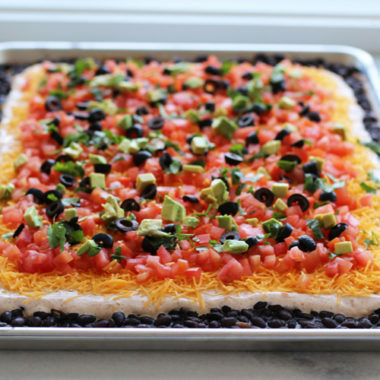 Tex Mex Dip is one of the most loved treats of the night! Spread the refried beans in the bottom of the cookie sheet. Rinse black beans, allow to dry or pat dry. Spread the black beans over the refried beans. Combine sour cream and taco seasoning and spread over beans. Cover the sour cream evenly with the shredded cheese. Sprinkle the diced tomatoes, chopped avocado, and sliced olives over the cheese.